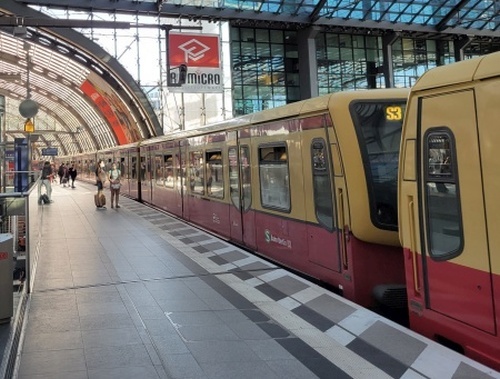 German cities have remarkable public transportation systems, especially when compared with American cities of equal size, and they operate with all the efficiency you'd expect from our Teutonic friends. Just about every town of substantial size has at minimum a bus system. Transport mode options increase considerably as the place you're in gets bigger. Public transportation is so good, you should never need or want a car to get around most cities. Overall, Germany probably has more urban public transportation systems, especially rail systems, than just about any other country in the world. Nearly every town and many rural areas have scheduled local bus service. In larger towns and cities, lines crisscross the city. Where local rail service is offered, buses compliment those services. In the biggest cities, there may be several different bus systems in operation. In Berlin, you'll even find double-decker buses. Service intervals vary widely depending on the location and time. Many large cities also offer night bus service. In some places, especially smaller towns, bus service is operated by GermanRail (Bahnbus). Most medium and large cities have a streetcar (tram) system, sometimes fairly extensive. In some areas, streetcar lines run underground in the central city area. Trams are especially prevalent in many eastern German cities. 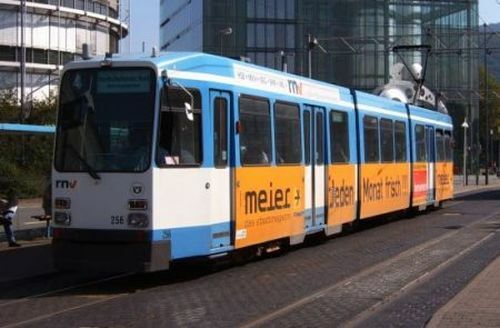 Most systems have been modernized with sleek new rolling stock and many systems now carry the Trambahn moniker. Service is fairly frequent, usually 20-30 minutes during off-peak periods. Some cities, most notably Frankfurt, Stuttgart, Hannover, Cologne, and cities in the Ruhr region, have relatively new light rail systems known as a Stadtbahn. 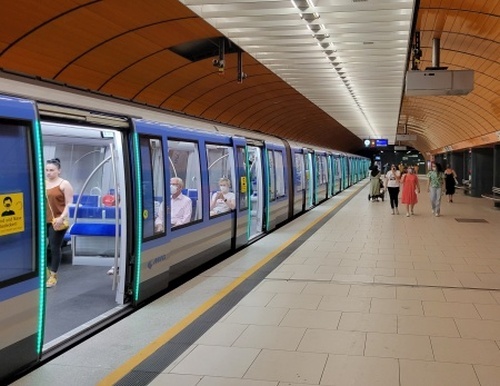 Generally, these systems function very much like a regular U-Bahn system (subway, see below) with wide-gauge tracks, longer trains, and high platforms. However, while the Stadtbahn usually runs in extensive tunnel networks within the central city areas, it runs mostly overground outside of the central city. When running overground, the Stadtbahn runs almost entirely in exclusive rights-of-way, making them faster than streetcars. These systems generally serve the central city and the immediate vicinity. Service is frequent, usually 10-20 minutes during off-peak periods. Stadtbahn lines are typically numbered with a "U" followed by a number (e.g. U2). Most Stadtbahn systems mark their stations with the standard "U" U-Bahn sign with the word "Stadtbahn" added below or across the "U". A few of Germany's largest cities have a full-fledged subway system, or U-Bahn. For the most part, these systems are located underground, but may run on elevated tracks or at ground level, especially in outlying areas. These systems generally serve the central city and the immediate vicinity. Service is frequent, usually 5-15 minutes during off-peak periods. U-bahn lines are typically numbered with a "U" followed by a number (e.g. U2). 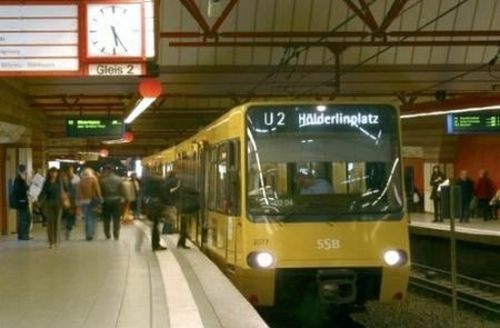 U-Bahn stations in all German cities are marked with the standard "U" sign shown at the left above. The largest metropolitan areas (Berlin, Hamburg, Munich, Frankfurt-Mainz-Wiesbaden, Stuttgart, Cologne-Düsseldorf-Ruhr District, Nuremburg, Dresden, Leipzig-Halle, Mannheim-Heidelberg-Karlsruhe, Magdeburg, and Rostock) have a brilliant suburban train system called the S-Bahn. These are express trains running from the central city deep into the suburbs. S-Bahn routes primarily run above ground except in the central city where they frequently are underground. In Berlin, most S-Bahn lines are elevated through the city. Service is fairly frequent, usually 20-30 minutes during off-peak periods. Besides providing suburban service, the S-Bahn also makes several stops in the central city area as well. These stops are generally further apart than those on the U-Bahn or Stadtbahn and therefore makes the S-Bahn a good option for longer central city journeys. Unlike the other systems above, which are operated by local governments or franchises, S-Bahn systems are all operated by GermanRail. As a result, you can use GermanRail tickets on them (see special note under Tickets below.) S-Bahn lines are typically numbered with an "S" followed by a number (e.g. S2). S-Bahn stations in all cities in Germany are marked with the standard "S" sign shown to the left above. Schwebebahn: Suspension railway; ride the famous one in Wuppertal if you get a chance-- it's over 100 years old! Also, many foreigners confuse or interchange S-Bahn with Straßenbahn or Stadtbahn. Again, all of these are quite different! Most transit systems use the central rail station (Hauptbahnhof) as a major hub. This makes it easy to get from the station to your hotel and vice versa. The transit maps for the largest cities are quite complex, oftentimes resembling some kind of electrical wiring diagram. But once you study them for a few minutes, they're usually pretty easy to understand. Most cities use color-coded schematic plans to make the system easier to decipher. They can be obtained for free from tourist offices and are usually included in guidebooks. You can also download a copy from the respective transit agency's websites (see links section at the bottom of this page.) You'll find them posted at most bus and streetcar stops and subway stations often sport life-sized versions along the platforms. Street maps of the surrounding neighborhood are also usually posted in rail stations making it easy to find your way from the station to your destination. In each city or metropolitan area, all of the transit networks operate under a single regional transport cooperative (Verkehrsverbund) with coordinated fares and tickets. A single ticket (Fahrkarte, Fahrschein, or Fahrausweis) is good for all modes of transport and is valid for transfers to other trains or buses needed to complete your journey. 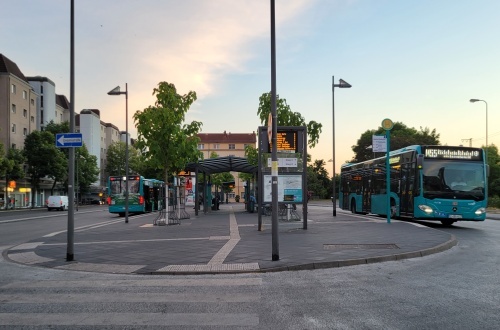 The specific rules vary depending on the city, but most systems allow you one complete trip in one continuous direction along the most direct route to your destination for a set length of time, usually two hours or so, including any transfers and interruptions. Fares on German transport networks are based on a zone system. The transport regions are divided into tariff zones (Tarifzonen) and you pay based on the number of zones you cross. Oftentimes, there is a central cluster of zones (Innenraum) covering the inner city. Typically, all tickets purchased in this cluster have the same price for journeys ending anywhere else in the cluster, even if it crosses a tariff zone. Fares generally range from €1-4; higher for longer distances. For buses, you can purchase your ticket from the driver. Simply state your final destination and he will tell you how much the fare is. Pay him and he will give you your ticket. In most German cities, the driver can make change, but it's probably a good idea to have enough change on-hand to pay the exact fare. If there is a ticket machine at the bus stop, you will have to purchase your ticket from the machine rather than the driver (see below). In some places, there are ticket machines on-board buses and trams; you'll need to purchase your ticket from one of these machines immediately after boarding. For rail systems, you will need to purchase your ticket before you board. 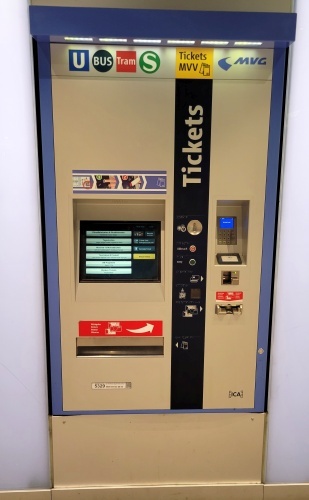 Tickets are available from automated ticket machines (labeled Fahrkarten, Fahrscheine, or Fahrausweise). The exact operation of these machines varies from city to city, but they all function basically the same, and many have instructions in English. On older-style machines, like the one pictured above, you typically find your destination (Fahrziel) either on a map or chart, note its zone, then push the corresponding button on the machine-- usually a combination of zone number and either adult (Erwachsene) or child (Kind). Then pay the amount shown on the display and take your ticket and any change. Most cities, though, now have new touch-screen machines which step you through the process in a number of different languages. 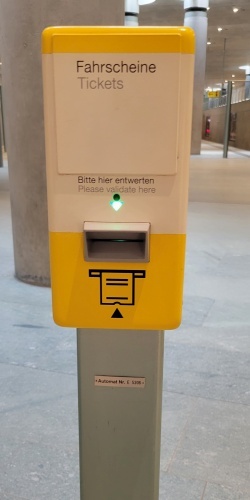 Depending on the city, once you purchase your ticket, you may then be required to validate it just before you use it-- look for the words "Entwerten" or "Entwerter" and an arrow on the ticket (see example below). If your ticket requires validation, find a small box with a slot on the front, usually marked Entwerter (see photo above). You'll typically find these located at the entrances to subway and rail stations and aboard buses and trams. Insert your ticket in the slot as indicated by the arrows. The date, time, and location will be stamped on the face of the ticket. Most cities also have special multi-tickets (Mehrfahrtenkarte or Streifenkarte). You purchase one ticket that is valid for several uses (usually 3-10), often at a slightly reduced price from the corresponding total of individual fares. The ticket has several numbered sections that correspond to each use. To use the ticket, you need to validate it before or as you begin each journey by inserting the next sequentially numbered section into the validating machine. Once validated, it works like an individual ticket with regards to use. On most systems, you can use a single multi-ticket for several people traveling together-- just validate one section of the ticket for each person (i.e. if you want to use it for two people, validate two sections of the ticket.) There are also 24-hour passes (Tageskarte) good for all modes of transit for an entire day. Some systems also sell a group day ticket which allows several people to use one 24-hour pass, or passes that also include admission to museums and attractions. 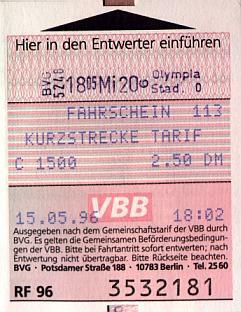 Finally, many cities have special tickets for short-distance journeys (up to three or four stops); these tickets (Kurzstreckekarte) cost considerably less than a full zone ticket. Note that most systems will allow you take your dog or bike on board trains and buses, but you may have to buy a ticket for them, most likely the children's fare or equivalent. Also note that bicycles may be restricted to certain cars and/or may not be allowed during rush hours. Once you have your ticket (and validated it if required), you may board the train or bus. Keep your ticket with you for the duration of your journey. German transit operates on the honor system. However, to keep honest people honest, undercover ticket inspectors (Fahrkartenkontrolleur) will periodically walk-through the trains checking tickets. When they approach (asking "Fahrkarten/ Fahrausweise, bitte"), hand them your ticket. Those without tickets are publicly humiliated, a torture which only ends by coughing-up the fine, usually €30-50 collected on the spot. Keep in mind that they've heard all the excuses (and being a foreigner is no excuse), so it's in your best interest to just pay up and get on with your life. Since GermanRail operates the S-Bahn systems, Eurail or GermanRail passes are valid on all S-Bahn trains. Your pass must be in effect for the day you want to use the S-Bahn (meaning that you must be using a travel day on flexipasses.) If you have a valid pass and use the S-Bahn in conjunction with other modes of public transportation for a journey, you will need to purchase a separate ticket for the segment of your trip that is not via S-Bahn. For instance, if your trip from Point A to Point C includes an S-Bahn from A to B and a U-Bahn from B to C, then you will need to purchase a ticket for the B to C segment, and you will need to purchase and/or validate this ticket when you reach Point B. Remember, Eurail/GermanRail passes are only valid on the S-Bahn, NOT on the U-Bahn, Stadtbahn, or trams. Here's an additional tip: if you have a flexipass and did not or will not be riding a long-distance mainline train on a given day, don't waste a flexipass day on S-Bahn travel-- you can get a 24-hour ticket or individual journey tickets much cheaper. Public transit in Germany is remarkably safe, even at night, but it's always wise to be aware of your surroundings. The main threat is pickpocketing, especially during peak periods and in the busier stations. Therefore, take extra precautions to safeguard any valuables that you may be carrying. At night, you should ride in the car nearest the operator. Emergency telephones (Notrufsäule) are located in every station and on board most trains, and police make frequent patrols, especially in areas where an increase in crime is noted. Several cities also have special call boxes at stations or on-board trains where you may arrange for taxi service to get to your final destination if necessary.